Eight-year-old Harriet is determined to climb to the top of Longs Peak in Colorado. To get there, she'll have to overcome steep slopes, a freezing blizzard, and what her wise trail guide calls "surprises." But she simply must try&150both for herself and for the mother she has lost. If she succeeds, she will spread her wings and fly . . . high as a hawk. 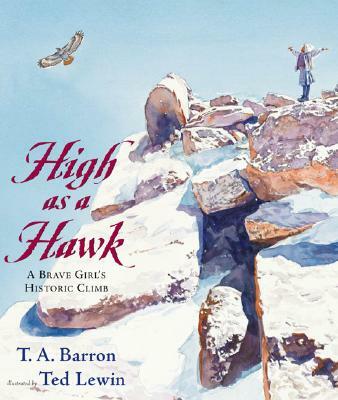 Based on the historic 1905 ascent by the youngest person ever to climb Longs Peak, the highest mountain in Colorado, this book combines T. A. Barron's powerful, poetic writing with Ted Lewin's magnificent, evocative paintings. Together, they make a truly inspiring journey. An author's note describes how the ascent encouraged guide Enos Mills to pursue his dream of creating the Rocky Mountain National Park.